The more I !earn about The Cold War, the more amazed I am on so many levels. The amount of espionage, planning, proxy support, and ultimately mutual respect and fear which kept us all alive in both The West and The East. I was born in 1983, my memories of the period can be summed up in three sentences. Said Mr. Gorbachev resigned and his Union and Pact dissolved. When it was over, nobody talked about it. It wasn't taught in schools. At the time, I just figured people wanted to forget about it. What I have learned is from talking to Baby Boomers and doing my own research. This is a country that tells it's young men, 'you are required by law to serve in the army from 18 until 34 as a reservist. We will give you a weapon for you to keep at home, we will call you when we need you. Oh, and by the way, we promise we won't get involved in other countries problems and we haven't been to war since The Napoleonic Wars.' Then they tell the world, 'we have booby trapped all our roads, bridges and passes. We have bases built into the sides of our mountains. Our building codes require every citizen to have houses impervious to air raids and nuclear fall out shelters in their back yard. We can field 50% of our population in an official capacity, and probably everyone else will fight too.' Their defense program is insanely popular as referenced by numerous referendums to abolish it. Seems like armed neutrality has its perks if you ask me. But again, I'll stop there before raptor locks the thread. The Swiss prep discussion is perfectly ok.
One other thing about the Swiss. It has no significant resources that are worth the trouble it would require to take them. So it is a skinny porcupine that even if you get past the quills has no meat for a meal per se. I would note that Norway in WW-2 attempted the neutrality stance but we're not as though as the Swiss and found themselves invaded an occupied. Norway also had needed ports and resources that could be used with or without the assistance of the Norwegians. As for the Cold War. I am a child of it and I remember duck and cover drills. The original Red Dawn style attack was what my school in the 60's (it was a military school) taught would happen if an attack happened. When I saw the original Red Dawn I thought I was back in school. Along the line of Cold War caches, my school had a rifle team that was supported by the .mil. They sent us 10 match grade Garands each year. These were then sent back at the end of the school year. In my senior year I was promoted to run the administrative division which included the armory. I was then told and became responsible for the "spare Garands" that were stored on siteyear round. There were 50 of them stored in crates that were sealed. I assume they were cosmolined for long term storage. The serial numbers were written on the outside of the crates. I was told the were spares for the other 10 match grade rifles and that was all I needed to know and not to mess with them for any reason. I assumed they were a cache in case TSHTF though I was never told that specifically. Last edited by raptor on Sun Nov 27, 2016 7:43 pm, edited 1 time in total. Government officials confessed yesterday that they were baffled by news of the 79 arsenals, disclosed by the US ambassador to Austria, Swanee Hunt, over the weekend. Chancellor Franz Vranitzky has demanded precise details of the locations of the arsenals, which reportedly each contained enough guns, pistols and explosives for some 150 anti-Communist rebels, and even substantial amounts of gold. According to Ms Hunt, the existence of the secret US arms arsenals had only come to light recently after the CIA decided to inform Congress about them. She said she was sorry Austria "was informed so late about the matter", describing it as a "relic from the Cold War". the January 25, 2000, Los Angeles Times. A former Soviet spy testified at a congressional hearing in Los Angeles on Monday that Russian intelligence operatives placed weapons and communications caches--perhaps even small nuclear devices--in California and other states as part of a plan to destabilize the United States through sabotage. Mitrokhin had smuggled information out of the Soviet Union and only had time to write down four specific locations of the caches--three in Switzerland and one in Belgium. When authorities accessed them, they found at least some evidence of intelligence activity. One bunker in Switzerland exploded when authorities sprayed it with a water cannon. Really amazing information! Thanks for stories and links! I have never heard of this. What does this standard contain? Are houses in Switzerland really this stout? Ummm... Have any of you seen Occupied? It is a Norwegian political thriller TV series with 10 episodes that premiered on TV2 on 5 October 2015. Based on an original idea by Jo Nesbø, the series is directed by Erik Skjoldbjærg and available on Netflix. I'm not aware of anyone finding a cache around here (not that they would say anything if they did). However, there was tons of military stuff lying around in the area when my mom and grandparents got here in the 1960s. My understanding is that it was detritus from some cold weather warfare training. Lots of .30-06 blanks in en bloc clips and belts, k-rations, field phone wire, etc. People picked most of it up, but a few years ago I found an en bloc clip of blanks and a guy down the road plowing a field churned up an ammo can of belted blanks. My uncle told me a story, but I haven't verified that it's true, of a guy out in the bush who discovered a large reservoir of diesel fuel left over from WW2. Supposedly he didn't tell anyone about it, and opened a store selling fuel to the community. Every once in a while a barge would show up and he would go out to it with a big fuel tank. Everyone assumed he was getting the tank filled with fuel to re-sell, but according to the story he was actually selling the fuel to the barge operator who was taking it elsewhere. quazi wrote: I'm not aware of anyone finding a cache around here (not that they would say anything if they did). However, there was tons of military stuff lying around in the area when my mom and grandparents got here in the 1960s. My understanding is that it was detritus from some cold weather warfare training. Lots of .30-06 blanks in en bloc clips and belts, k-rations, field phone wire, etc. I remember back in the early 2000's ( like around 2006) some duck hunters found a 50 cal Browning set up on it's tripod at Lake Milford ( the lake is across the street for a several miles from Fort Riley ). I don't remember the particulars but I seem to recall it was not from the fort. Actually a well know cache is in Iceland. We left in the 80's (I believe, could be early 90s) but when we did we just closed the doors and left. We assumed that the snow and ice would bury it. This was true at the time but supposedly now there is some worry due to the possibility of climate change. The government admitted this in a report stating that were some low level supplies of nuclear and chemical weapons(mostly research material). The real issue not addressed is possible biologic weapons( Iceland is an island, with a small population, with an environment hostile to viral and bacterial life, and easily monitored) and if they survived. Iceland while part of Nato does not have a military and I mean no military they have what might be considered at best a large swat team. In the 90's the count was 250 members. I would consider the threat there small due to weather conditions but some small biological life has been proven to live even in the cold and radiated upper atmosphere. Russia has their Death Lake and we have Iceland and hopefully those in charge took adequate measures to ensure public safety. When I joined the Military, I swore an Oath to Uphold and Defend the Constitution. Keeping in mind that I am no authority on the matter but scrolling through Google (https://www.google.com/search?q=Swiss+h ... DSCi31M%3A) and trying to focus on pictures that are really from Switzerland, I do not see a lot of below ground construction (Basements, or at least basement windows) but in comparison to North American construction, I see a bit more masonry and stone construction and a pattern of concrete ground floors, which I think is common to European architecture. I am not seeing anything that I would consider especially air raid tolerant. Are there hidden bunkers? Are those ground floors tougher than they look? Thoughts? Dabster wrote: I am not seeing anything that I would consider especially air raid tolerant. Are there hidden bunkers? Are those ground floors tougher than they look? Thoughts? This is just a guess, but that seems like the kind of code that would either have so many exceptions and loopholes that most people wouldn't have to follow it and/or it wouldn't be very well enforced for practical reasons. I was in High School when Red Dawn came out. Around that time me and the group of juvenile delinquents I had for friends discovered an old spam-Hercules missile site (outside of DC). It was off in the woods in a large overgrown wooded lot. While the main entrance was blocked with debris the ventilation shafts had never been filled and being the bright kids that we were we climbed down in to the site. The site was still filled with old equipment, blast doors and launching stations. The missile bay was sadly empty but a lot of stuff was still there. This became our place to drink beer and make out with whatever girls we could convince to shimmy down the ventilation shaft. After Red Dawn came out we decided this would be base from which to conduct our guerilla operations. We even collected a small arsenal of 2 - .22 rifles and a .410 shotgun. It was the guns that got us in trouble. Or I should say the 0100 alcohol inspired outdoors target practice. Nothing like being chased by a Fairfax County Deputies around the woods at o'dark 30. They never did catch us. But they did find our party/ guerilla warfare base. We steered clear the next weekend and then went back out there. They had dumped several tons of gravel down the shaft and that was the end of that. Another person living in a fallout shelter in Geneva. Switzerland. Geneva. Katie Clarke is a British citizen and used to be a soprano singer. She is now a homeless woman seated on a chair and eating supper in the fallout shelter Richemont. 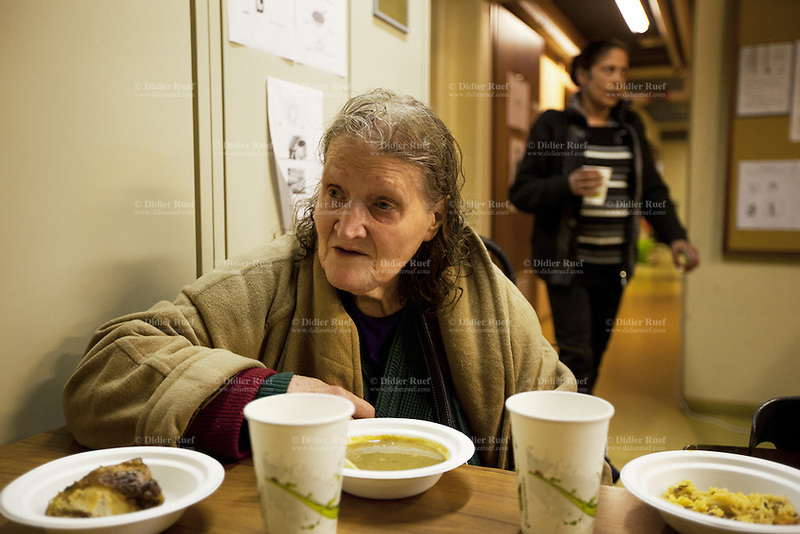 A Romani (Gypsy) woman from Romania is also spending the night. The article took great pains to point out the 'homeless people' staying in the public shelters are all foreign. The Swiss recently passed a law to exclude these undesirable people from the country. 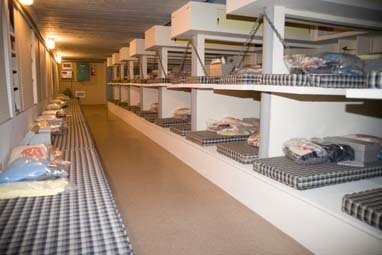 Apartment block (apt building in the US) shelter. Required by law. Living cheek-to-jowl in the land of the Swiss. This photo tells the tale of the "shelter program" - the few badly done public shelters in the US are no more. There are lots of shelters, just not for the public. A roadside attraction in Toronto? 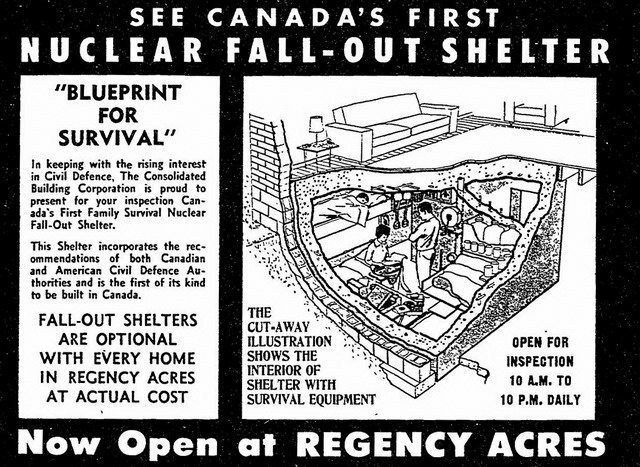 I couldn't find any images or articles on anything uniquely "Canadian" other than abandoned military shelters. Likely as not, the public shelter program is as defunct as the one in the US. I never did say WIWD. So Actively resist the Russians and then after beating them go find the idiots that allowed it to happen in the first place. Although in all fairness they have not been needed either. So long as it stays that way I am good with it. For the Swiss they serve as another deterrent for invaders. The tiny country that could easily have gotten gobbled up in WWII or one of the many other wars Europe has engaged in over the years. Since the Swiss live near forever I imagine a large bit of the population has not forgotten what it was like being an island in Europe. In parts of the US we have lots of storm shelters. These can work in a pinch for some purposes but most are not stocked or equipped for more than a few hours use. They could be adapted. Do the guns and other equipment, minus explosives and NFA type stuff, now belong to the finder or does ownership revert back to the Feds ? State laws vary widely on found property rights and what constitutes theft. IMO (not legal advice) if it has been decades I'd consider it abandoned. If it has been out there forever it was probably surveyed and declared a loss. Blanks and magazines would have been considered expended. The burden would normally be on the government to assert ownership, proof of ownership and make a demand for the items. I would not hold my breath for that. I see your point, but I think the nature of the items and the nature of the 'rightful owner' would supersede any law written by a mere state on property. The Feds tell the states what the law is and how it's applied, not the other way around. But if I ever found a cache of weapons, nobody would ever know. Sometimes ignorance and plausible deniability really are the best defense. I would be shocked if you found a usable arms cache if the .gov did not claim it. If there were NFA items involved your chance of lawfully keeping them are nil IMO. Now unexploded ordinance especially expended rounds I am positive that they would deny any compensation for damage if there was damage. IMO the most likely action would be to destroy the cache in place if it had explosives and the area was remote, as one would expect with such a cache. Edited to add: There is a story about a 22,000 lb Tall Boy bomb that was a gate guard in the UK for decades. They went to move it and then realized that it was not dewat but rather still filled with HE. It is amazing the stuff that gets left somewhere. I would be shocked if they would. Certain things like submerged wrecks and aircraft are still considered US property. I am willing to bet even if you found the holy grail of a case of Garands they would not care. Any NFA items you find will need to be surrendered to someone or could land you in prison. That is an ATF issue.